The Louisiana Superdome is back in business, more than a year after Hurricane Katrina's devastation. On Monday night, the iconic symbol of New Orleans will put the newsreels of storm-inspired misery behind it and get back to what it was built for — big-time events. Unlike its relatively low-key dedication ceremony in 1975, Monday's coming-out party promises to be a star-studded, media-heavy event. On the field, it's a matchup of unbeaten archrivals, the Saints and the Atlanta Falcons. Off the field, it's an opportunity to exorcise some of the demons in the soul of a city that suffered through one of the nation's worst natural disasters. "We know that the Superdome was symbolic of a lot of misery," Gov. Kathleen Blanco said. "It's now a symbol of our recovery. It stands as a symbol of all of our experiences over the past year." The glitz began long before the game. Television networks began broadcasting from the city days in advance. The national anthem Monday night will be sung by local favorites Irma Thomas and Allen Toussaint, with Kermit Ruffins on trumpet. The Goo Goo Dolls, Green Day and U2 will perform before the game, and the Southern University marching band will provide the halftime show. The pregame coin toss will be handled by former President George H.W. Bush, who was nominated for the presidency in the building at the 1988 Republican convention. A cadre of 150 Katrina first responders will stand with Bush. Blanco, former NFL commissioner Paul Tagliabue and his successor, Roger Goodell, and Mayor Ray Nagin — a Saints fan since the team first took the field in 1967 — also are expected. "It's certainly a lot bigger than the normal Week 3 Monday night game," said NFL director of corporate communications Brian McCarthy. "In terms of production, scope and interest it resembles a Super Bowl production a lot." That's a shocking difference from Aug. 29, 2005, when Katrina's winds ripped the roof from the stadium. Some 30,000 hurricane refugees eventually were sheltered there. By the time the last of those survivors left the Superdome almost a week later, it was a wreck — and an enduring vision of chaos and depravity. Seventy percent of the roof had failed, and 3.8 million gallons of water had to be pumped out of the Dome and its garages. With no air conditioning, mold and mildew grew quickly. The stench inside the massive building was overwhelming — a mixture of sewage from backed-up toilets and 4,000 tons of trash and debris. "When I walked out of the building after Hurricane Katrina, I didn't know if we had seen the last game and seen the last concert in there," said Superdome manager Glenn Menard, who spent almost a week in the building before and after the storm. "It's a tremendous transformation from what we left and what it is now. To be able to do this in 13 months is amazing." There were those who felt the Superdome should be demolished after the hurricane. But building a new arena would have cost about $600 million, and in a cash-strapped state that was not likely. The Federal Emergency Management Agency paid for $115 million worth of repairs. The state put up $13 million, as required by FEMA. The Louisiana Stadium & Expedition District refinanced a bond package used for other sports facilities in the area to secure $41 million, and the NFL contributed a $15 million grant. Ellerbe Becket, a design firm that had been studying the Superdome for possible upgrades before the storm, quickly did an assessment of Katrina's damage. A month after the storm, officials decided on an extensive makeover. Sanitizing and water and mold removal began in October. Construction began in earnest in March. 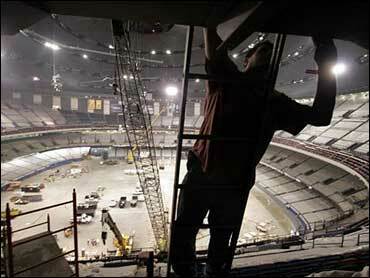 At the peak of the project, 700 people worked inside the Superdome and another 120 were on the 9.7-acre roof. These days, the rebuilt roof is a gleaming white, the air in the dome is fresh, the seats are dry and the football field is brand new. A test last week in which every toilet was flushed at the same time proved the plumbing is in tiptop shape. When a national television audience tunes in Monday night, viewers will see much more than another football game. "It'll blow them away," said Superdome spokesman Bill Curl. The Saints, after using San Antonio as their home base last year, initially were a bit reluctant to commit to returning to the Dome this season. But team owner Tom Benson said he's been pleasantly surprised. "You'll all be proud of what they've been able to accomplish in a short time," Benson said. Storm damage has been fixed. The roof and 440,000 square feet of steel panels that support it have been replaced. Inside, nearly all the 500,000 square feet of ceiling tiles and 800,000 square feet of damaged gypsum wallboard are new. More than 1.6 million square feet of soggy carpet is gone and a new epoxy flooring covers the ramps and upper-level concourses. Eye-catching technology updates are in place. New scoreboards, video boards and an LED ribbon board system have been installed. The end zones sport new 27-by-48-foot scoreboards. There will be four high-tech 8-by-44 scoreboards in the corners of each end zone, and four new 183-foot-long LED halo boards along the facade of the second level. Very little will escape the eyes of a sellout crowd of 68,000-plus fans or the army of news media descending on the city for Monday night's game. Besides the 200 media credentials the Saints usually issue for a game, the team has distributed nearly 550 credentials to ESPN alone for its extensive coverage plans. In addition, more than 500 national and international requests have rolled in, including The Weather Channel, the HSN cable shopping network, and Arab-world network Al-Jazeera, Saints spokesman Greg Bensel said. Superdome officials have set up a special media center and other facilities to accommodate the crush. Almost lost in the hype is the game itself, in which new Saints coach Sean Payton and many new players make their New Orleans debut against Michael Vick and the Falcons. For new Saints quarterback Drew Brees, the emotional high of taking on the Falcons in prime time is overshadowed by the gravity of the occasion. To Brees, the Superdome — site of six Super Bowls, a mass celebrated by Pope John Paul II and the convention that propelled Bush to the presidency — has a new and enduring place in the history of New Orleans. "To think of all the people the Superdome saved," he said, "you look at that arena as more than just a football stadium."